Up to now, we have mostly concentrated on waves that propagate through warm plasmas possessing Maxwellian velocity distributions. We found that, under certain circumstances, damping occurs because of a transfer of energy from the wave to a group of particles that satisfy some resonance condition. Moreover, the damping rate only depends on the properties of the velocity distribution function in the resonant region of velocity space. It turns out that if the velocity distribution function is not Maxwellian (for instance, if the distribution function possesses multiple maxima) then it is possible for the energy transfer to be reversed, so that the wave grows at the expense of the kinetic energy of the resonant particles. This type of plasma instability, which depends on the exact shape of the velocity distribution function, is generally known as a velocity-space instability (Cairns 1985). and . Taking to be real and positive, the question of whether the system is stable or not is equivalent to asking whether Equation (8.126) is satisfied for any value of lying in the upper half of the complex plane. Figure 8.10: A Nyquist diagram. To answer the previous question, we employ a standard result in complex variable theory which states that the number of zeros minus the number of poles of in a given region of the complex plane is times the increase in the argument of as moves once counter-clockwise around the boundary of this region (Flanigan 2010). To determine the latter quantity, we construct what is known as a Nyquist diagram (Nyquist 1932). Because the region in which we are interested is the upper-half complex plane, we let follow the semi-circular path shown in Figure 8.10(a), and plot the corresponding path followed in the complex plane by , as illustrated in Figure 8.10(b). Now, as . Hence, if the radius of the semicircle in Figure 8.10(a) tends to infinity, then only that part of the contour running along the real axis is important, and the contour starts and finishes at the origin. Because the function is analytic in the upper-half plane, by virtue of the way in which it is defined, the number of zeros of is equal to the change in argument (divided by ) of this quantity as the path shown in Figure 8.10(b) is followed. However, this is just the number of times that the path encircles the point . 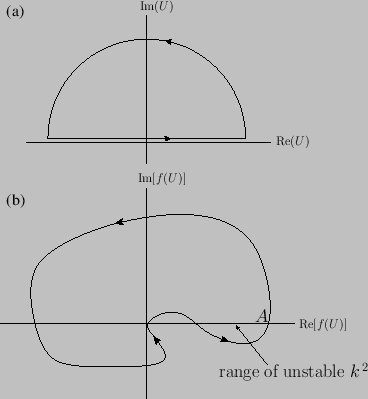 Hence, the criterion for instability is that the path should encircle part of the positive real axis. Thus, in Figure 8.10(b), the system is unstable for the indicated values of (Cairns 1985). Here, has been chosen as the constant of integration in order to again make it unnecessary to take the principal part. The previous relation is called the Penrose condition, and is a necessary and sufficient condition for instability, assuming that attains a minimum value at (Penrose 1960). The previous discussion implies that a single-humped velocity distribution function, such as a Maxwellian, is absolutely stable to velocity-space instabilities (Gardner 1963). This follows because there is no finite value of at which such a distribution function attains a minimum value. In fact, assuming that the distribution function, , is such that as , we deduce that an unstable distribution function must possess at least one minimum and two maxima for in the range .